Herat is the second largest city in Afghanistan and known for the historic Citadel complex located on top of a hill with expansive views of the city. The city’s main shrines, Shahzada Abdullah and Shahzada Qasim, were built in the 15th century and reconstructed under a project supported by the US Embassy in Kabul and the Aga Khan Trust for Culture. Women and children leave Shahzada Abdullah in Khuandiz, in the historic center of Herat, once capital of Central Asia. Under the patronage of Queen Gowhar Shad, the daughter-in-law of Tamerlane, Herat was a center of arts and learning in the fifteenth and sixteenth centuries CE. Clad in plain-fired brick, the tomb’s exterior is graced with ogee portal arches. Women visit the tomb of Prince Abdullah bin Mu’awiyya inside Shahzada Abdullah mausoleum in Herat, Afghanistan. Built in the fifteenth century CE, the mausoleum features some of the finest Timurid tile-work from medieval Herat. The tomb’s restoration was carried out by the Afghan Cultural Heritage Consulting Organization (ACHCO) with financial support from the U.S. Embassy in Kabul. An ornamental vault, known as a muqarnas, inside Shahzada Abdullah’s mausoleum. These intricate, plaster muqarnas are traditional features in Islamic architecture from Iran all the way to Morocco. During restoration, the muqarnas were repaired and repainted using natural ochre pigments, true to the original techniques. 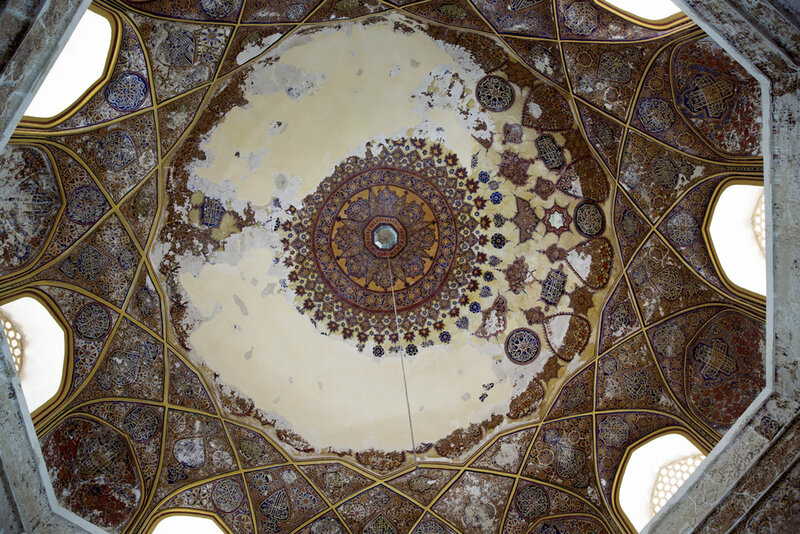 An upward view of the exquisitely painted central dome of the interior of Shahzada Abdullah, spanning 12.5 m, the dome underwent structural stabilization to its original brickwork, and plaster and paint were judiciously re-applied to the most fragile areas. 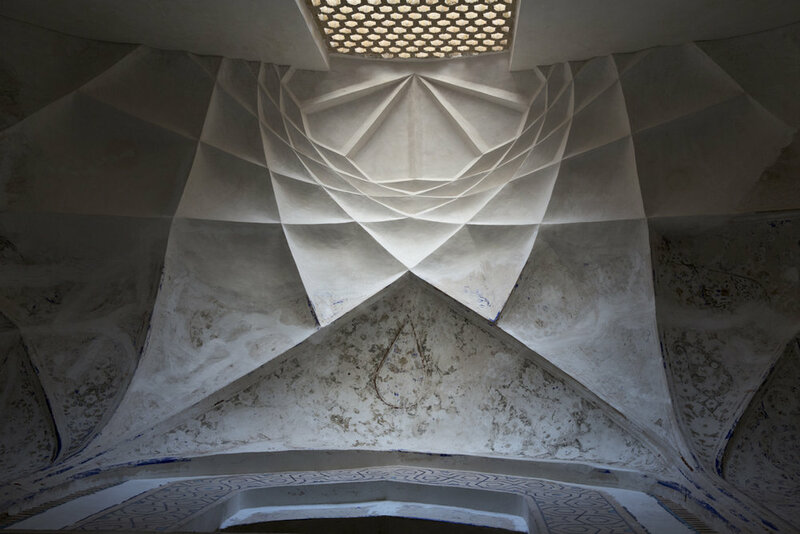 Sunlight filters through an original fire-brick lattice screen, illuminating an intricate geometry of lines in the karabandi style, inside Shahzada Abdullah’s mausoleum. 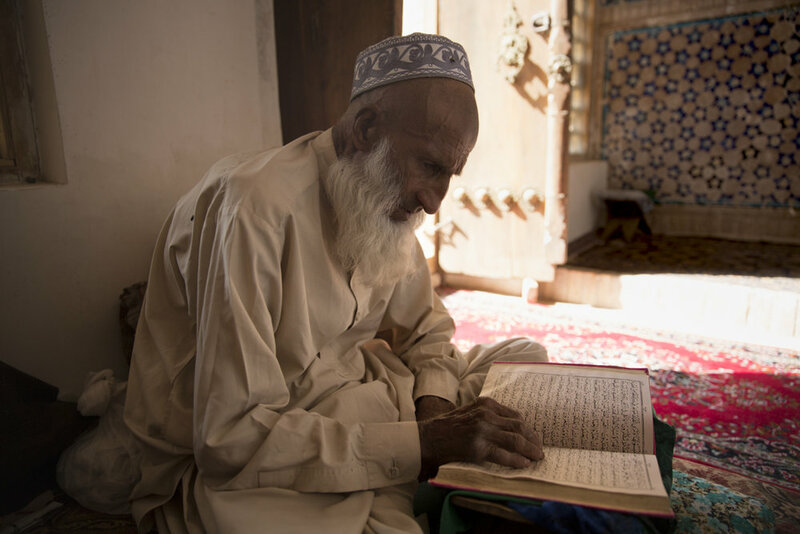 A man reads from the Koran in a quiet corner of Shahzada Abdullah‘s mausoleum in Herat. Project Engineer Habib Noori gazes out from the rooftop of Shahzada Abdullah’s west iwan, whose dome underwent extensive repairs and stabilization during restoration. Herati children clean the gravestone of their grandparents, buried outside the Shahzada Abdullah mausoleum in Herat, Afghanistan. Families traditionally clean the gravestones of their ancestors before the Eid al-Adha (Festival of Sacrifice). Near Shahzada Abdullah stands another mausoleum, Shahzada Abdul Qasim, which has elements dating back to the pre-Islamic Sasanian era (second to fifth century CE). While the latter shrine is Shiite, Shahzada Abdullah is Sunni. It is common for devotees in Herat to visit both, a reflection of the citizens’ religious tolerance.